The response of some of my students to the task of reading a poem is not, unfortunately, atypical. Where does this anxiety about poetry come from? How can we let go of that anxiety, rediscover the pleasure of poetry, and share our delight in it with our children? Many of us may trace our anxiety about poetry back to middle or high school classes, where poems are usually taken up as objects to analyze rather than as experiences to enjoy. The process of analysis can be a process of mystification; it implies that poetry is full of hidden meanings that can be uncovered only through a great deal of ingenuity. Children, however, are unconcerned with hidden meanings — and are naturally drawn to poetry. After all, poetry is of the body. Even free verse poets pay special attention to the sonic qualities of language — the rhythm of the syllables, the sounds of the consonants and vowels. And so much of poetry originates in play: play with language, image, metaphor, and strange juxtapositions. What on Earth do these lines mean? Does it even matter whether or not you understand? Of course not! Years ago, a voice teacher instructed me to “chew the words” as I sing. I love that image! Don’t worry about understanding or not understanding. Be like a child again! Just chew the words! Find some poets, books, and/or poems that you like. Read and re-read them, again and again, aloud if possible. I speak from experience. I, too, was once estranged from poetry — baffled by it, left in the dark. And then, about twelve years ago, I realized that all those notebooks I had filled with (pretty bad) poetry throughout high school and all those late nights I had spent reading Elizabeth Bishop, Muriel Rukeyser, Denise Levertov, Anne Sexton, Sylvia Plath, and Alicia Ostriker in my Norton Anthology of Literature by Women could only mean one thing: I was a poet! Clearly, I had to get over my bafflement — and I did so by taking stacks and stacks of books of poetry from the library, finding poets I liked, and reading their work again and again and again…. Whatever your relationship to poetry may be, these are books you — and your family — are likely to enjoy. 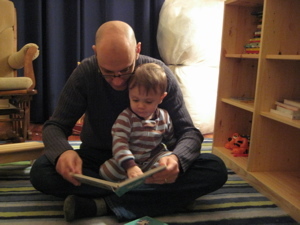 If you are hoping to renew your feeling for poetry, I especially recommend reading with your children so that you may share in their natural enthusiasm for wordplay and surprise. Oh, you must come from a hairy god. Where do you get your funny voice? Glub blub, little squid. Glub blub, why blub do you glub have blub Glubblub blub such glub inky blub stuff blubbb? Dog, why are you here? Your shiny fur shines in the night. How come you don’t talk? on rollers made from orange-juice cans. The hairdo is shaped like a pyre. of burnt hair and bumblebee husks. Also, there is the book’s final poem, “Neonatology,” a collage that captures all the wonder and fear of crossing the threshold from expectant to first-time mother. “Giving birth is like jazz, something from silence, / then all of it,” begins the poem’s conclusion, which you can read here. This room, and this chair. I will not let down my hair. Viorst has also written a second collection of poems, titled Sad Underwear and Other Complications. What about you? What are your favorite books of poetry to read — on your own or with your children? This is absolutely fantastic!! I need to be able to come back to it again and again. Thank you for pulling all this together so well. I’m really wanting to dip back into poetry. And you’re so right, my little one totally gets it already! Thank you, Teresa! Do let me know how the dipping back into poetry goes. Koch’s book is an especially great place to start. The children’s poems in that book are so inspiring.